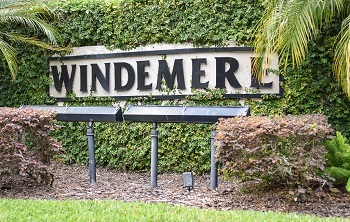 In the popular East Lake area of Palm Harbor, Florida is the attractive neighborhood of Windemere. This community located north on East Lake Road in Ridgemoor, Windemere offers upscale real estate properties built in the late 1980s and early 1990s. The spectacular homes for sale offer three, four and five bedroom single family homes with custom interior designs unique to themselves. The homes of Windemere fashion large split floor plans and great rooms, with special features such as central vacuum, gourmet kitchens, breakfast nooks, built in shelves, fireplaces, and more. The lush landscaping throughout adds to the scenery around this neighborhood of trees, ponds, and quiet charm. You can own an amazing property in Windemere for a moderate price and enjoy a low monthly maintenance fee. Included in the fees of this beautiful gated community are tennis courts, playgrounds, and security. Conveniently located to all shopping, a great school district, library, restaurants, and more, this community is also just down the street from Lansbrook public golf course, the Pinellas Trail, YMCA, and the most beautiful and enormous county parks with pavilions, boat ramps, and playgrounds. Selling your home in Windemere? Windemere is a great neighborhood and we really love working there. Give us a chance to earn your trust when you are ready to sell your home. Conact us today about making the most out of a possible sale on your home at 727-314-1000 or by using the form below. Make a change today. We are here to help you navigate the process and prepare for your next adventure.